In retrospect, Gorbachev’s biggest miscalculation was the decision to allow free elections of republican and local Soviets. The 1990 elections took place when the Communist Party and socialism had lost their credibility, when national movements were rising in the constituent republics, and when Eastern European Communist regimes were falling from power. Prior to the local elections, the opposition movements in the republics had relied on the support of the reformist leadership in Moscow in their struggle against local conservatives. However, having defeated the Communists in the local elections, the new republican elites no longer saw the all-union center and Gorbachev as their protectors because they now derived legitimacy from their voting constituencies. Armed with a popular mandate, the victorious opposition changed the emphasis of the political struggle from the “democratic” to the “ethnic” aspect. The goals of national revival and independence, particularly in the Baltic and Transcaucasian republics, came to the fore. As a result, the internal power struggle in the republics gave way to the mounting confrontation between the republics and the Kremlin. The forces that initially had been sponsored and encouraged by the reformist center now turned against it. The newly elected republican parliaments engaged in the “war of laws” against Moscow, insisting on the supremacy of their local laws over those of the Soviet Union. They paralyzed centralist controls even further by declarations of sovereignty and claims of sovereign control over the assets in their territories. The decisive moment came in 1990, when Russia, the biggest of the republics, proclaimed its sovereignty and declared that its laws took precedence over the laws of the USSR. The result of this political reform was the disintegration of the Soviet political and constitutional systems. 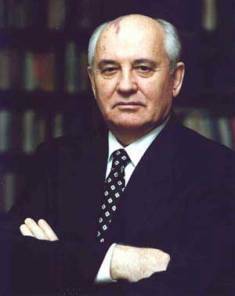 Gorbachev’s political reform was a belated and inconsistent attempt to save the Soviet system. He sought political reform that would allow authorities to rule, relying on new sources of legitimacy and without constantly threatening their political opponents with repression. This in itself meant a revolution in Soviet politics. It was a desperate and unsuccessful attempt to renovate the facade of the Communist system by preserving many of its fundamental elements. Although it failed to rescue the Communist system from disintegration, it brought about cardinal changes indispensable for further democratization, including the surge of popular participation, the legalization of public and political associations and popular movements, the acknowledgment of the right to strike, the rise of political pluralism, the establishment of regular democratic elections, and the emergence of a multiparty system. PREVIOUS GO TO "THE USSR'S COLLAPSE"